InVision updates its app so that you can design, discuss and collaborate, no matter where you are. If you're using InVision to manage your design projects, you're probably getting on just fine with its design, project management and feedback tools and its ability to get on with your existing tools. But if you've ever found yourself wishing that you could be a little more plugged into your project when you're out and about, InVision has a treat for you in the form of its updated app. 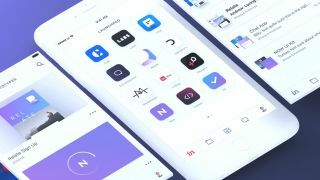 Invision for iOS 2.0 is an all-new version, completely redesigned to make it even easier to keep projects moving while you’re on the go, and key to this is its new Conversations tab. Found in the InVision app's menu bar, the Conversations tab is a great way to keep track of all the discussions around all of your projects, wherever you are. With it you can view and comment on prototypes, collaborate with your team on projects, address feedback and resolve comments, and wrap up reviews, all in real time. And with all your activity and discussions in one easy-to-navigate place, you'll never miss an important update or vital detail. The latest InVision app is available for free right now from the App Store, for iPhone, iPad and Apple Watch. So no matter whether you're working from home, stuck on the bus or out for lunch, you need never feel out of the loop again.